Thank you again for the information. I’ve started to write more reviews on Amazon as a reader. And one day I may need reviews on my first novel. Reblogging on my author facebook page https://www.facebook.com/PatriciaMarieRobertson/?ref=bookmarks. Another nail in the coffin of my hopes and dreams, to be some instant success. I’m sticking with being an Indy, keeping my day job, and sharing things like this as far and wide as I can get them. Thank you for this. Helpful in cementing that I’m on the right path as an Indy trying to build up readership on RoyalRoad and FB. It isn’t a nail in the coffin, since many indies and hybrids are doing very well. The way to make a good income as a traditional writer is to be picked up AFTER you are already a band and doing decent at sales. Then they can take distribution to a higher level and you are more likely to get those premium spots. Also, if you are hybrid, you have the advantage of those compounded sales. But to take off in a bookstore is a far harder thing to do in the digital age. I already forwarded this to my husband, who keeps telling me to write faster so we can retire. I keep telling him our retirement home will be a used refrigerator box if he plans to live off my writing revenue. Thanks for the truth, the whole truth, and nothing but the truth. Well, don’t be too hard on yourself. A writer can make good money these days but we can’t rely on the traditional ways of doing it which was 1) write book 2) get agent 3) land book deal 4) get in bookstore 5) wait. It involves a lot more these days but the author middle class IS coming back 🙂 . Succinct and straightforward. I shared this on my blog. Some cold hard truths to match the freezing temperature outside. It’s a tough business. I totally remember dreaming about a big advance. Now I’m afraid to be offered ANY advance because I don’t want to shoot myself in the foot. I’m aiming for hybrid author status. I have some novels with obviously market appeal and I’m hoping an agent will agree with me and pick them up. My genre-crossing YA books? I’m looking at small indie presses because I’ve found I don’t like managing the cover artist, editors and all that. I want to WRITE, but I need pros to do that stuff so my books are professional quality (because readers deserve that). Excellent overview of the publishing business! Nice post, follow for follow? Do you feel Goodreads is unimportant? I have read conflicting things on this. I know in your book you say to target people who aren’t readers using social media, but I’ve also read you can’t ignore Goodreads because there are a lot of readers there, and why ignore people who ARE readers? Also, I read recently that Goodreads reviews are actually more important than reviews on other mediums. What is your opinion on that? Another question: If bookstores rip off the covers and send back the books that don’t sell, why does B&N have so many books with red dots on their clearance tables for $2? Does the author get screwed in that scenario? I will confess I’ve bought a lot of $2 books off the B&N clearance table. We don’t have to ignore Goodreads I just don’t care for it. When I do write a review I often will copy and paste it on GR too. Amazon owns Goodreads anyway and I have found that Amazon is better at shutting down trolls. My big gripe with Goodreads historically is they don’t do a very good job of protecting writers from bullies. The red dot books are probably remaindered copies. I appreciate what Kristen said about goodreads. I don’t think indie authors make any money getting good reviews there and the place is a shark tank. The majority of goodreads reader members have low opinions of ALL indie authors. Most of the goodreads reader groups are antagonistic towards authors and I have seen a few that did support authors fail because they did so. Be careful in there if you’re an author. I have had all positive reviews on goodreads but it hasn’t done a thing for sales that I can tell. Thanks, I appreciate the other perspective. I did a lot of reading this weekend and read a blog by an author who claimed her sales improved markedly after she spent time engaging with people on GR, and then improved more after she got more reviews (in all mediums, she probably had a point there). However, I also read a separate article that listed a bunch of points about why GR reviews are so important. I think one of them had to do with GR reviews being shared more places. Thank you for sharing your insight with us. Like you said with the volume of content, trying to find reliable advice about publishing can be frustratingly cumbersome. So thank you again. So much truth! Something you didn’t touch on is that you might get signed to a small press, and they may GO OUT OF BUSINESS TWO WEEKS BEFORE YOUR BOOK COMES OUT. Ahem. (Got my rights back, thank god.) Thanks for all your smart words! Thanks for walking us babies through the haunted woods, Kristen. You earn your super cape every time. You really don’t know publishing until you work in it! The first year of my job really opened my eyes, not what I expected at all, especially from a writers point of view ? Everything you’ve said about the industry is spot on. I know several published writers and their stories match this verbatim, especially the sad truth about remainders. That being said, I disagree about giving poor reviews. To me, to refuse to review a book I dislike is tantamount to giving a passing grade to every student in my class, whether they do the work or not. If reviewers only give positive reviews, how will I know what books to avoid? If I give a one or two star review, I try to make sure to be as objective as possible so that readers understand why I’m rating the book so low. If I believe the book will find an audience who will apprepciate it despite its flaws, I’ll be the first to point it out. But buyers need to know that not every reader enjoyed a book. If I’m looking at a book and it gets a poor review, (and I’m interested in the book) I make sure to read the review to learn why the reviewer tanked it. If the review is reasonable, I take that into considerartion in my purchase. If the reviewer is simply venting, “this author couldn’t write his way out of a paper bag,” or “this is the stupidest book I ever read” then I ignore the review. Reviews are for readers, not writers. We owe readers our honest reaction (if Amazon allows it, which is increasingly a gamble these days). I can’t agree less Phillip. We need to support each other or we all starve. My favorite aunt once said, “If you can’t say anything nice, don’t say anything at all.” I have given bad reviews to famous, well-established writers on goodreads but that doesn’t damage them the way it does struggling new writers. Kindness will be rewarded by good karma and your bad review is only your opinion, not an establishment of fact that the book you read was bad an not worth reading. I only agree they get a good review if they earned it. Propping up bad writing just hurts all of us. Yeah I go back and forth on this. On one hand writers get knifed enough without doing it to each other. But I think we aren’t getting good critical reviews either. I have read quite a few bad books recently and the reviews were very misleading. I just know that in this business we need to work with other writers and it is hard to work with people who have knifed you. Below are Kristen’s sad/wise/loving/helpful words. I add to them my own idea. What if all of us who are writers and followers of writers were to agree to review each other’s books on Amazon. I know some of you think quid pro quo reviews are sleazy and that all reviews should be honestly given without any pressure for a good review. That’s almost a direct quote from one of my author friends whose books I love and whose advice is otherwise excellent. Well, read what Kristen says below and then you decide. She’s right about how hard it is to establish a foundation for publishing — a fan base that will get your next book noticed. She’s right in saying that it’s unkind (and imo bad karma) to give a fellow author a bad review. So, here’s my whole idea. Send me email to jinisfantasy@hotmail.com with an offer to trade reviews with me and put our reviews on Amazon. Read the first half of my book and, if you don’t like it, stop reading and don’t review it. If you do like it, post your review on Amazon. I will do the same for your book. Multiple copies of a new book? What kind of second-hand bookstore is this?! Thanks for the tips. Writing my first full novel has been a real learning curve – and now no doubt working through the process of publishing it will be a whole ‘nother curve of its own. Do NOT get me started. I landed myself in hot water over that opinion a year ago. You don’t really see that here in NZ – or maybe I just don’t go to the right (wrong) second-hand bookstores. Thank you for all the helpful information. Now back to my book. Also, I tried to like this post, but my connection is a bit off. Does make me wonder why we work so hard to write a novel in the first place. I already know I will never quit my day job to become a full time writer, and this confirms it. So, what you’re saying is…. Traditional publishing stinks. Hmmm… Haven’t had any success there as of yet. You may be right. Traditional has its place. I think they are better for taking an author who has already demonstrated sales and then taking that author to another level of distribution (I.e. “The Martian”). Kristen, your history of B & N’s and Borders’ rise (frappucinos for all! crumbs for authors!) really hit me. My writers’ group meets in B & N and all around us in the cafe sit readers with piles of books, sipping coffee and eating scones. The tired cafe personnel go table to table clearing abandoned books. My mom raised me different. I just can’t. But culture has shifted and those surrounding my writers’ group have to be noted. Your guide to the Wild West is much appreciated. Great post. I will share with friends. I never leave a negative review. If I don’t like the overall book, I find what I did like. Karma. I have an excellent critique group with other published authors and editors so I will pass along your offer for a critique to someone who can benefit more. Yes! This is so true about readers! I usually love my readers, but after posting my stories for free and getting a lack of reviews, I just quit posting the story. I review only indie books on my blog. I copy those reviews to Goodreads, but not Amazon, because I’ve heard of Amazon deleting all of someone’s reviews because of perceived personal connections with the author, even if those connections are only on social media. But I agree that reviews by readers who aren’t also writers (are there any left these days?) are pure gold. Great post with a huge number of points in it all worth plenty of air-time and discussion (as do the comments). I’ll just add a sense of scale for new authors. One of the later ebooks in my series sold a copy last month. It rose 3.6 MILLION places in the ranking list. 1 copy. Just makes you think of how many books are out there selling nothing. Great post for those who think writers can cover the rent with their royalties!! Thank you for this insightful article Kristen. That all important author platform. Can you say love/hate relationship? My first novel is published and although the second one in the series is happening, most of my time has been devoted to building my author platform and as Kristen reminds us, reviews are the most important. Thank you again Kristen for your words of wisdom. A very informative and insightful post. Just as well I have a day job. Thanks, Kristen. Wow. I can scarcely believe that bit about taking books to a coffee shop at Barnes and Noble and ruining them. We are so NOT allowed to do that in the UK! Yeah, some book retailers also sell candy bars, packaged sandwiches and the such, but spilling coffee on an unpurchased book is almost inconcievable for an honest person (i.e. someone who has not stolen it). Maybe its just a cultural thing- that you cannot take that book anywhere until you pay for it. This is really an excellent overview, and I learned a lot of things I was not aware of before. I am glad that I have a habit of buying new books just because I love the experience! I am also going to be reviewing more often! I was wondering if you know anything about how they decide to display books in libraries? I was curious if it is similar to the big book stores or if it is more chance and based on the librarian’s preference. Thank you so much! I think that is library preference, though authors really don’t make money with libraries (making reviews even MORE important). I know, but that is where I get most of the books I read to my children or to read for myself and when I really like something, I go out and buy it to share with someone else or the kids. Just wondering for exposure sake. Thanks! Love this! Thank you, Kristen. As a young aspiring writer, it’s great to read from someone who’s been there and done that. Do you have any advice about fiction blogging? I’m trying to post short stories and get subscribers to build traction and a brand. An In depth look at publishing. Thanks to Chris The Story Reading Ape for sharing this. Excellent post, as always! I love what you said about the weight of readers reviews. Such a great article! Thank you for taking the time to write and inform the rest of us, as a writer and book-devourer. ? You’ve certainly earned shares from me. Great post! I shared on my blog. Very timely. I will include writing Amazon reviews on my list of new year resolutions. 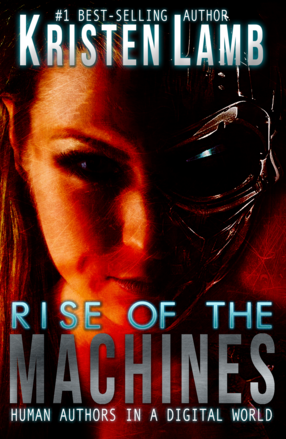 First up in Jan – Rise of the Machines! Thanks for sharing your wisdom and insights throughout the year. It’s been too long since I’ve visited your blog! Time to get back into it for the new year. Kristen Lamb published a very important article about publishing and what writers need to know about it. Thank you for the truth, Kristen! Is there a ‘protocol’ for writing a review for an unknown author colleague? Some harsh truths and important insights into the world of publishing, summarized very well by Kristen Lamb. I encourage all readers and fellow writers (especially fledgling writers) to read this and take an extended moment to think about how important it is that we support each other; especially readers supporting the writers they like. Cheers everyone! 2016 is almost done! I’m attaching a link to Kristen Lamb’s blog and her very timely post regarding the truth about publishing. Here is the link: https://warriorwriters.wordpress.com/2016/12/19/the-hard-truth-about-publishing-what-writers-readers-need-to-know. Really good info. So, please, go read, become an avid review posting addict for your favorite authors, and help keep we authors writing with our lights on and our computers buzzing. “Here’s a terrific post on ‘the reality of the book publishing industry’. I love the honesty (or brutal truth). It’s true for the American market but for the Australian market; the reality is that a bestseller only sells about 5,000 books. Plenty of authors sell under that, unless they market themselves well. That tells you the hard work I’ll have to do through the year before the launch of my book. Thanks for such a helpful post, Kristen. Wait, Kristen, hold on here. I worked for Barnes & Noble for seven years. I’m not a business expert nor am I B&N hack, but you have some of your facts wrong. Some of your accusations about brick and mortar stores are true perhaps of other bookstores but not all are true of B&N. B&N sells very few books for big discounts, especially if they are new or are hot commodities. A small number of books are selected for discount promotion each month, usually the highly anticipated titles, but the discounts are modest and for limited amounts of time. B&N pushes its purchased membership program for customers who want discounts, with limited success. Books that show up on the big discount aisles, less than $10 a book, are generally older titles of popular authors or are re-published public domain classics. As for what shows up front and center in the bookstore: yes, some space is bought by publishers, not by authors (as far as I know.) Again, the big titles or famous authors who make the bookstore run. You are right that the café readers are a huge pain in the tush for stores but it has become part of the territory. Coffee shop/bookstore browse all you want as if you’re in the library. I’ll never forget the irate a-hole who demanded that we stay open past 11:00 PM so he could continue to drink the single latte he’d bought at 6 while he ruined books and magazines for hours. B&N did not pulp books, ever, nor magazines. We did tear off covers of older issues of mags before returning them to the publisher, (who wants to buy a week old Time magazine?) but books were returned whole to the publishers. I suspect they would eventually go to the remainder shelves of other bookstores. B&N tried for years to maintain large sections of the store devoted to every genre of literature you can name, and posted upholstered chairs where you could sit and read. And plenty of the store was dedicated to non-fiction and magazines and newspapers as well as to the children’s department (that remains intact in most of their stores today.) B&N had a section for first time publications and for the work of authors that B&N promoted as winners of their new authors’ program. Yes, it was a bit of self-promotion, but please don’t say that new authors didn’t have a chance. Every store had its vagrant community who came in and spent the day staying warm in our aisles as well as parents who used the store as their babysitter, homework monitor, and free research center. The loss to the store because of damaged product and destroyed furniture was large though not matched by the amount of theft. We welcomed authors to launch at B&N, we invited all kinds of groups to come in and celebrate their reading specialty at the store. It’s where I began my now 12-year relationship with my critique group. Yes, B&N overwhelmed the indie bookstores except of those who figured out how to focus on specialty sales departments. Many of the booksellers like me loved books, were trying to get our own work published, and gladly recommended all kinds of material to guests. We liked working at B&N. What finally ruined B&N’s older come-in-and-stay-for-the-day model was in fact Amazon, where readers could buy books often at a discount and have them delivered free. Once Amazon introduced its Kindle e-reader, B&N realized more competition than it could absorb. Finally B&N gave in and turned over huge sections of the bookshelves to selling toys, games, movies, and home specialty home décor items as well as larger sections of novels for young adults and the emerging new adult genre as well as the cafe. And of course, for the Nook, B&N’s own e-reader. Many readers resisted e-readers for years preferring a hard copy. Now maybe half of those who read regularly, read on a device rather than an actual book in hand. Where once B&N showcased multiple copies of many titles of an author, they were now down to one copy of the author’s most recent book unless that person was Rowling, King, or Patterson or a few of those other well known writers. I was there when we started the big changeover, and all of us felt an emotional punch at the loss of our book backlog. B&N is today trying to figure out how to remain a solvent player in a market changing rapidly for many reasons. I don’t work there anymore but I wish it well. I want people to read, I want kids to read, I want writers to know that B&N is a good place to find their books. I believe in books and bookstores. I believe B&N wants to remain a viable store for people who like to read and for writers whose books should be on the shelves – it just has to figure out how to be that place in this decade and the next. I think you’re confusing the publication industry with the bookstore industry – they’re neighbors but not family. I don’t know. I am glad you had a nice experience. Some of my best memories are of browsing/shopping B&N. They really lost me as a fan when they deliberately set up locations across from every indie bookstore with the purpose of driving the Mom and Pop under. They obliterated the indies in DFW much like Starbucks did to every small coffee shop. A lot of the observations I make are from the publishing side of it. New authors who need the discoverability are never going to get on those front tables unless they get an rocking agent. I get it. It’s business. But the way they really hurt authors is they won’t carry backlists in the store. Yes, they have lots of shelves with lots of variety and trust me I still shop there. But in order to do this, they can’t shelve the backlists that used to be the bread and butter of the author. Because of this many authors had their backlists shelved. I know this because when the paradigm shifted some of the NYTBSAs who first broke away self-published backlists NY didn’t want. But the second they saw authors making money, they grabbed up all the rights…but then did nothing with perfectly good books (a lot of kerfluffle over this back in 2012). Since B&N and Borders were the only game in town and didn’t want backlists for anyone other than mega authors? Sure, they will shelve a gazillion Stephen King books or Nora Roberts books (because of course those sell) but the mid list author? The one who really news those multiple title sales? Not so much. I think it is a real mess. All of it. I wish B&N would have been happy with one or two stores and trusted that the comfy chairs and coffee would bring us. I resented a B&N every two miles down every major street. It was just greedy. That Mom & Pop wasn’t going to damage their sales, but those small stores really were helpful to writers. I hope they retool and reinvigorate. I am not a fan of shopping solely on line. I still go in there and buy books and there is something to be said for the brick-and-mortar experience. Thanks so much for your helpful insights. Quick question, it seems that Bookbub needing an unknown, unpublished minimum number of reviews is Urban Legend. What do you think or know on this topic? I know you have to have a certain amount of reviews for Bookbub to let you use their services. What an excellent post! So glad you put everything out on the table for everyone. When I signed my book deal someone at work asked me if I was going to quit my job. I explained that based on my small advance there was no way I would be able to do that. Here we are a few years later and my book has been out for a year. Nope- still nowhere close to quitting my day job. Most people just assume I am making a ton of money, but they don’t understand about paying back the advance and then the amount that gets made after that point. Friday Roundup – 30th December | Stevie Turner, Indie Author.